Bears are large, hostile creatures that will attack you if found infringing on their territory, and can typically be found in the wilderness or in caves. They are impressive creatures, much larger than the average adventurer, especially when standing up on their rear feet. Bears also have two main types of attack: biting, or standing up on the rear legs and mauling you with their paws. They are also not terribly fast in speed or agility. All variations of bears have a 20% resistance to frost and also have a 10% chance to transmit the Yellow Tick disease, which deducts both your speed and strength attributes. While the stronger bear variants will not appear until after you've reached the levels shown, you will continue to meet low-level versions even at high levels. You can still encounter all variants at least two levels earlier as boss-leveled creatures. 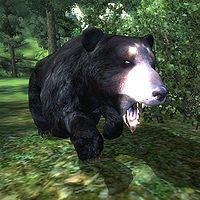 Black Bears are typically the first variant of bear encountered within Cyrodiil, starting at level 9. They can typically be found inside of caves or deep within forested regions. Unlike their counterpart, the Brown Bear, they are smaller in appearance and are significantly weaker. However, they can also be summoned by nearby Spriggans and can be looted for their pelts if encountered in the wild. ^aThis variant may be invisible when encountered near Fort Caractacus. Brown Bears are encountered as early as level 16, and unlike their earlier variation, are much stronger and larger in comparison. Apart from caves and forested regions, they are found in areas of snow and higher altitudes, such as in the Jerall Mountains. 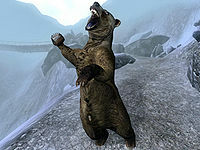 Brown Bears cannot be summoned by nearby Spriggans, but they can still be looted for their pelts. ^aThis variant may be a possible opponent in the Arena Grand Champion matches at level 14. 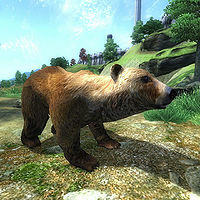 The West Weald bear variations can also be encountered as either Brown Bear or Black Bear variants, but are confined to the West Weald region and can only be looted for their bear fangs during the related quest. If you are wearing the Boots of the CrusaderKotN, only standard Black Bear and Brown Bear variations will no longer attack you. All other variations will still attack as usual. Usually only Spriggans have the ability to summon Black Bear variants. However, with the Spell Tomes download, it makes this spell available to you as well. This page was last modified on 28 October 2018, at 08:32.